Destiny Read gives you an easy way to access and download checked-out Follett eBooks and Audiobooks. It is available for iOS devices in the App Store. Once you log in, you will see a list of Follett eBooks and Audiobooks checked out to you. 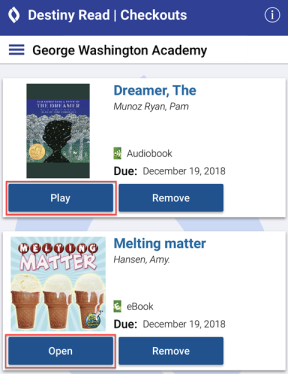 Note: To find and check out Follett eBooks and Audiobooks, go to Destiny Discover, which can be accessed from a browser, the Destiny Discover app or a link or shortcut provided by your librarian. To download a checked-out title, tap Download. To download all checked-out Follett eBooks or Audiobooks at once, tap , and then select Download All eBooks or Download All Audiobooks. To start reading, tap Open or Play. You can remove a downloaded title by tapping Remove. Follett eBooks and Audiobooks are returned automatically at the end of the loan period. To return a title early, tap Return. Note: This option is only available for titles that are not currently downloaded. To return all Follett eBooks or Audiobooks at once, tap , and then select Return All eBooks or Return All Audiobooks. ©2019 Follett School Solutions, Inc.